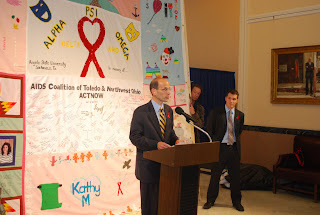 On December 1st, the 20th Anniversary of World AIDS Day, Governor Baldacci and Dr. Mills joined Andrew Bossie, the Executive Director of the Maine AIDS Alliance and a number of others in the State House Hall of Flags for an event marked by celebration, somber remembrances, and a garnering of leadership. We celebrated that life expectancy for those diagnosed with AIDS has increased from 4 months for those diagnosed 20 years ago to 8 years and climbing for those diagnosed now. 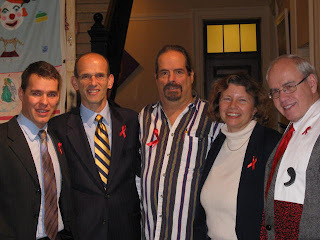 We remembered the hundreds of Mainers who have died of AIDS over the years. And, we garnered political, health, and faith-based leadership to address the challenges faced by the estimated 1,600 Mainers diagnosed with HIV and to prevent the further spread of the infection. I felt privileged to play a role in this day, and met some incredible Mainers with inspiring stories!